optical fiber and SDI connections that let you connect to your switcher with a single cable! The Blackmagic Studio Camera is available in HD and Ultra HD models, and is packed with all the advanced features you need for multi camera production and broadcast! Now you can produce multiple camera live production in any location! 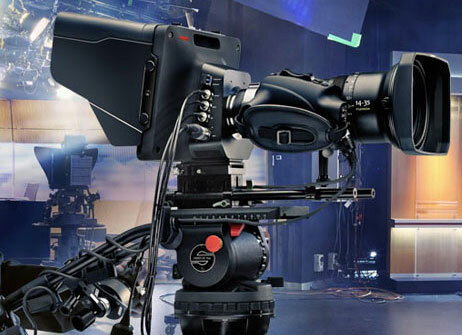 The super bright large viewfinder and compact size of the Blackmagic Studio Camera makes it perfect for talk shows, sitcoms and broadcast news in the studio, or even live concerts and sporting events. The incredible lightweight compact design, foldable sunshade and interchangeable lenses mean you can pack an entire multi camera live production rig into a single road case! Because it’s so easy to setup and use, the Blackmagic Studio Camera is also perfect for corporate AV departments, houses of worship, schools and more! 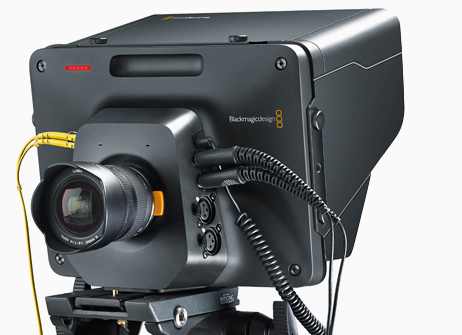 The Blackmagic Studio Camera is the world’s first to include a built in fiber optic connection, allowing you to use a single thin tether cable to connect cameras to your live production switchers. The optical fiber connection is bi-directional and carries HD or Ultra HD video with embedded audio, talkback, tally and even camera remote control. And because it uses standard, low cost fiber optic cable, you can connect cameras over massive distances almost anywhere, even at the largest outdoor venues. The Blackmagic Studio Camera features an active Micro Four Thirds lens mount that is compatible with an incredibly wide range of lenses and adapters. 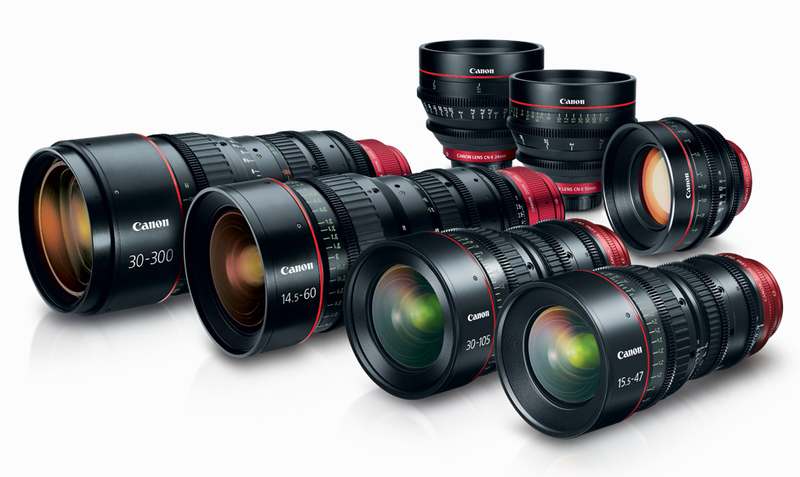 You can use your existing photo lenses for smaller setups or fixed camera use, or then bolt on incredible broadcast ENG lenses for large live broadcasts. Third party lens adapters let you connect to all kinds of lens mounts for any type of lens you choose, and you can even add feature film PL mount lenses, allowing you to customize your camera to suit any size production! 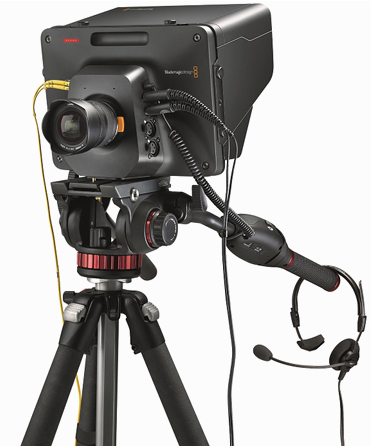 The Blackmagic Studio Camera features built in talkback so the camera operator and crew can communicate at all times during production. You get general aviation headset connections so you can choose from a wide range of aviation headsets, so you get better quality talkback headsets with better noise canceling and a much lower cost. 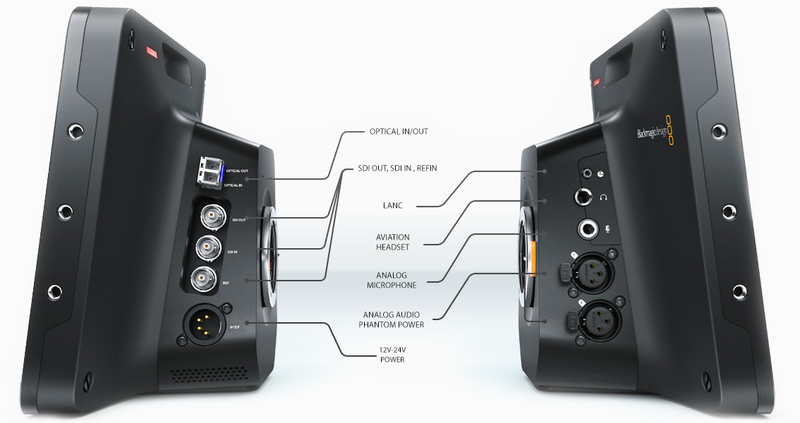 Setup is easy because talkback is embedded in the optical or SDI video connection to the camera, so you don’t have to run separate talkback cables! Know when you’re on air! The Blackmagic Studio camera supports the tally SDI standard used on the ATEM range of live production switchers. This means the tally from the switcher is broadcast to all cameras from all video outputs of the ATEM switcher and it’s sent to the Blackmagic Studio Camera via the program video connection. Tally lights illuminate automatically when your camera is live, and will stay illuminated during multiple camera transitions. With a light on the front for talent, and a light above the viewfinder for the operator, cast and crew can easily see which cameras are on air. 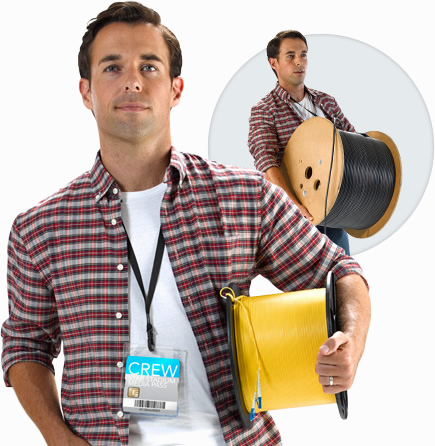 Featuring broadcast quality connections you get bi-directional optical fiber and SDI connections for connecting to live production switchers or recorders. Also included is a professional aviation headsets jack, stereo XLR microphone inputs, and more. All connections are logically organized on the left and right sides of the camera, making them accessible and easy to use. Because the Blackmagic Studio Camera uses standard connectors, you don’t need expensive custom cables! Cover the whole event on a single charge! The Blackmagic Studio Camera might be small, but it includes a massive battery that will power the camera for over 4 hours! This means you can run a simple optical fiber tether to remote locations and the camera is fully powered and self contained with full talkback, tally and return program feed. 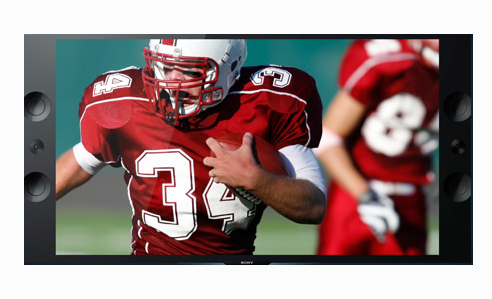 That’s perfect for live sports and other events where the cameras are long distances away from the switcher. When it’s time to connect power, an industry standard 12V 4 pin XLR power connector is built in for better strength and compatibility. Professional audio live from the camera! 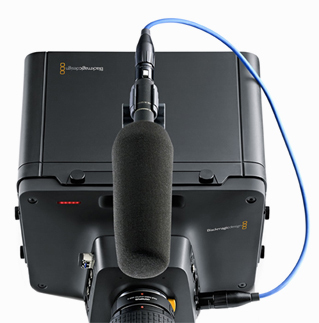 For productions that require live location sound, you can use the built in stereo microphone or plug in professional external microphones, even with phantom power, into the camera’s XLR connectors! This gives you fantastic quality live audio from your cameras and is super critical when covering live sports! Camera audio is automatically embedded with the video signal for connection to the ATEM live production switcher’s built in audio mixer. 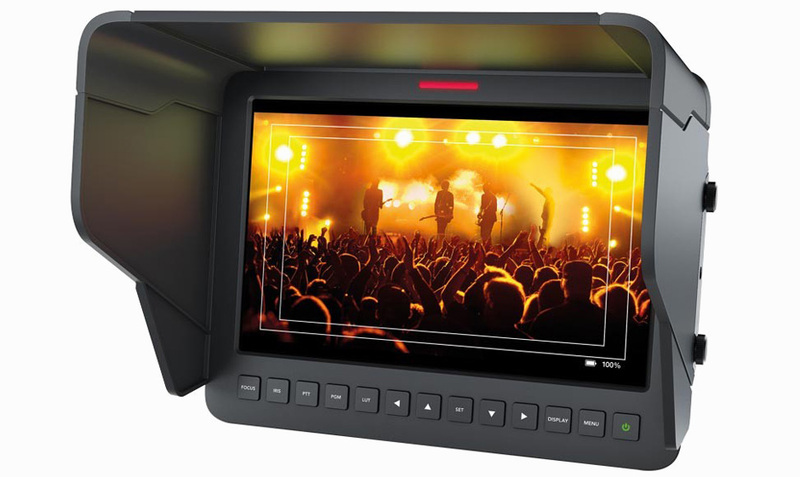 Advanced broadcast camera for live HD production with 10” viewfinder, MFT lens mount, support for up to 1080p60, 4 hour battery, talkback, tally and more. 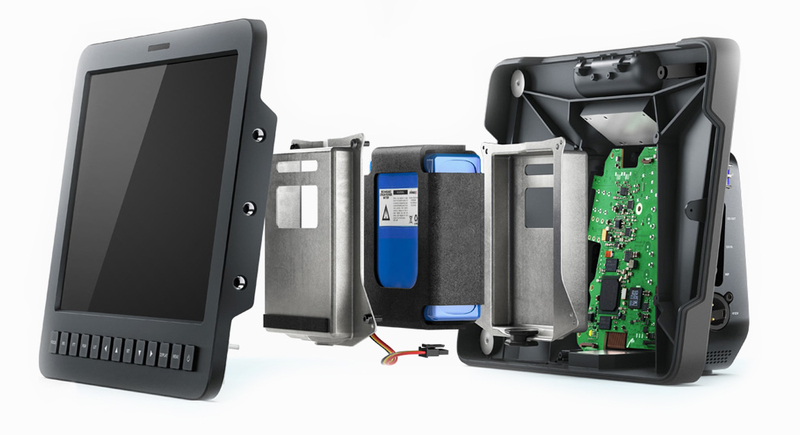 The world’s first 12G-SDI broadcast camera for live Ultra HD production with 10” viewfinder, 12G- SDI, MFT lens mount, support for up to 2160p60, 4 hour battery, talkback, tally and more.